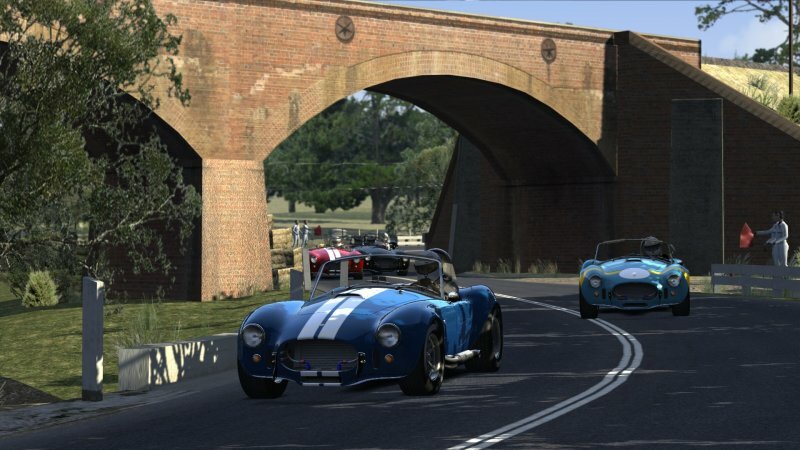 This Conversion is permited by Live For Speed Dev Team: http://www.lfs.net/ Live for Speed (LFS) is a racing simulator developed by a three person team comprising Scawen Roberts, Eric Bailey, and Victor van Vlaardingen. The main focus is to provide a realistic racing experience for the online multiplayer game and to allow single player races against AI cars. Users can set personal bests which can then be uploaded to LFSWorld in hotlap mode, and take driving lessons in 'training' mode. I release the BETA 0.8 in the UHD Version (some 4K textures) and the HD Version. Tell me what do you think about the performance of this BETA versions and reported errors. 0.8 Track specifications: - 18 pitboxes (i'm building another new pit area for more pitboxes) - working pitlane - fully working AI - trackmap Extract to Assetto Corsa tracks folder and race it. Version 6.0 needs you to totally remove previous versions. If you fancy yourself as a skinner, please feel free to help us out on the 2013 skins and we can post the mod into the list. Version 6.0 has some all important physics tweaks and hopefully all cars are visible this time, Coulthard was missing. We are proud that this mod was built from the ground up at FVRFactor. 99% of the mod is scratch built, wretched thing the wipers and driver. We also have a User Interface on our website for the mod. The mod has multiple options in it to suit various configurations of how you want to drive. We have incorporated 5 years of trackconfigs so we have captured diff and tyres and depending on your track year should rubn the correct items. The 2015 season is included with test skins and Adelaide skins at present. There is the new 2016 and the old faithful 2014. There is our newly modelled VF as promised for the 2015 and 2016 series plus the inclusion of our FGX for 2015 and 2016. All 5 cars represented over these years were built in house from scratch by our FlashQld, painted by Ferret40. Sounds were done by Bebop01 who has since departed to do other things. dBens1 and Feralarri have combined on physics and tyres, with Feralarri assisting me to compile this latest version. We are but a small team of friends spread out on the East Coast of Australia to Tasmania. Please understand that if you find a fault we are only human, this is a hobby and we're not waging any wars over this. If you don't like FVR don't download because we've been there and we do this for our own enjoyment. If you don't like it then you don't like it but if you do that's great. We'd love to hear from you if you do. Please don't rip any parts from it (those that threatened they would) we worked a long time on this and please show some respect in the process. This mod is CPM enabled. Special thanks to the following: Ferret40 - Skins and templates dBens1 - Physics Feralarri - Physics and Tyres Bebop01 - All sounds FlashQld - All 3D models, scripting and stuff FVR Special Access Members for their testing and fault finding. A few of you guys went above and beyond, stay tuned for some more testing very soon. Aerobaticrug bigchook Blastermatt buzzhornet cgood124 chrisfry82 coops craigbowie feepit684 Feralarri highpriest holden1968 JimmyT K9VING mag1965 Nebehr noobsbane283 RockShark Sals1 Stoffel tixeon V8Skinner vancstar xtra-large FVR Members for just being there. Our dogs, cats, partners and kids Racing-Leagues.com for their support and testing. They have a 2016 series starting January all welcome. Forum. Here is a PRE-RELEASE of Las Vegas. Version 0.92 Known Issues: Not all flag workers are functioning. AI racing line needs refining. Forum. Well, now the cat is out of the bag and since no one from our team is currently working on the track it makes no sense to keep these files private. Enjoy the current alpha for what it is and if you feel like updating/improving, please download and share the ModDev and Max files The simple goal of this release is to darken the textures and make the course usable for everyone while the "real" version is being developed. HUGE thanks to Kuato, Georg, Mario and the Targa Team for making the dev files available so this course can be further developed and brought up to rF2 standards. Calder Park LMS by R1CHO.